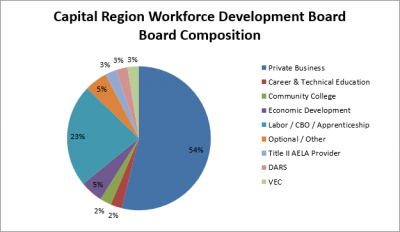 The Capital Region Workforce Development Board brings together business and industry, education, economic development and other public entities striving to ensure adequate investment in today’s workforce; and preparing tomorrow’s workforce to ensure they have the skills to meet the demand of the region’s growth sectors. Scott Edwards, Anord Critical Power Inc.
William Wheeler, Kosmo Machine Inc.
Business members must be nominated by a Chamber of Commerce within the region, one of the local economic development offices, another business organization or association, or by another business. Nominations must be submitted to the CRWP Administrative Office. The staff will review the nomination and make a recommendation to the Elected Officials. The Consortium of Local Elected Officials meet every other month, so it may take up to 60 days from the date of a receipt of the official nomination form for the nominee to be fully considered, and a response given to the nominee. If you would like to sit-in on a CRWDB meeting, please note their meeting schedule CRWDB 2017-2018 Mtg Schedule. If you have any questions regarding the CRWDB, please call 804-652-3225.